In the wet August of 1648, Lieutenant General Oliver Cromwell led 9000 battle-weary soldiers across the Pennines from Yorkshire to Lancashire. 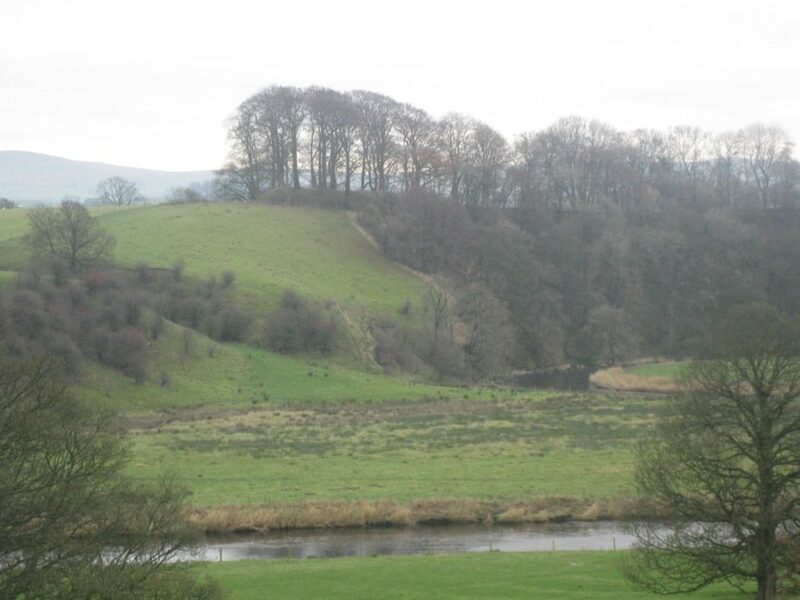 His New Model Army ended up on the banks of the River Ribble where they defeated Royalist troops coming south from Scotland in the decisive Battle of Preston. Cromwell recorded the route he took in his regular despatches to Parliament. 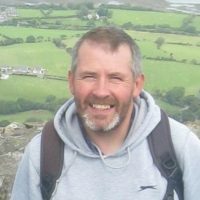 I retraced this journey on foot and discovered an unspoilt countryside of grand sweeping rivers, parkland and moorland ridges. I encountered medieval churches and bridges, Roman roads and prehistoric tracks, fortified manor houses, castles and ruined abbeys. 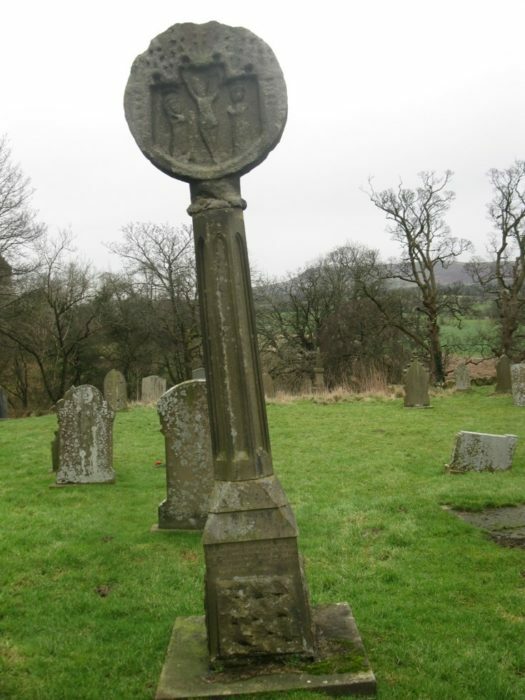 I also passed through several historic market towns worthy of exploration – Otley, Ilkley, Skipton and Clitheroe. 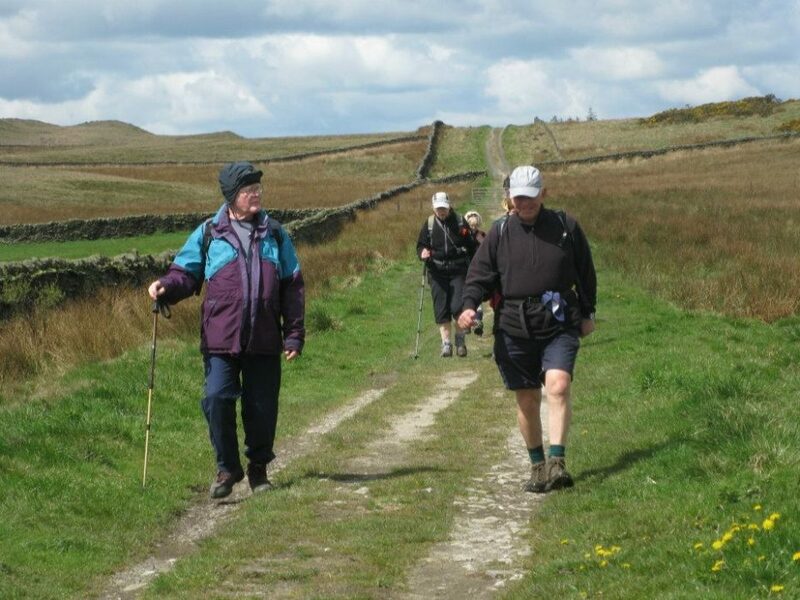 The Parliamentarian army – some on foot, some on horseback and some pulling heavy artillery – took four days to journey from Otley to Preston, covering a distance of approximately 15 miles a day. 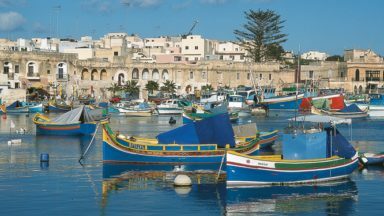 I aimed to stick closely to their itinerary. On the outskirts of Knaresborough, Cromwell’s troops met up with the Northern Parliamentary army, under the command of Yorkshireman Major General John Lambert. 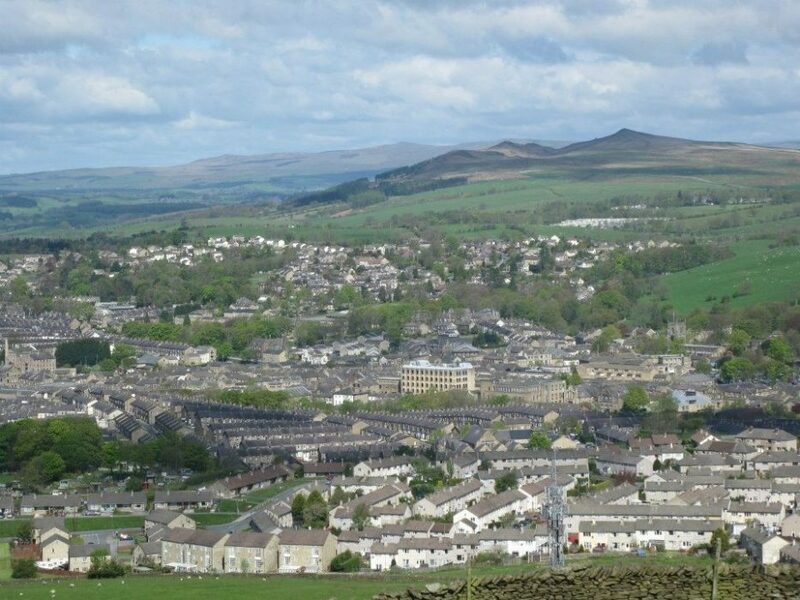 The following day, 14 August 1648, they entered Otley and marched upstream and over the moors to Skipton, where they camped in the shadow of the town’s castle. 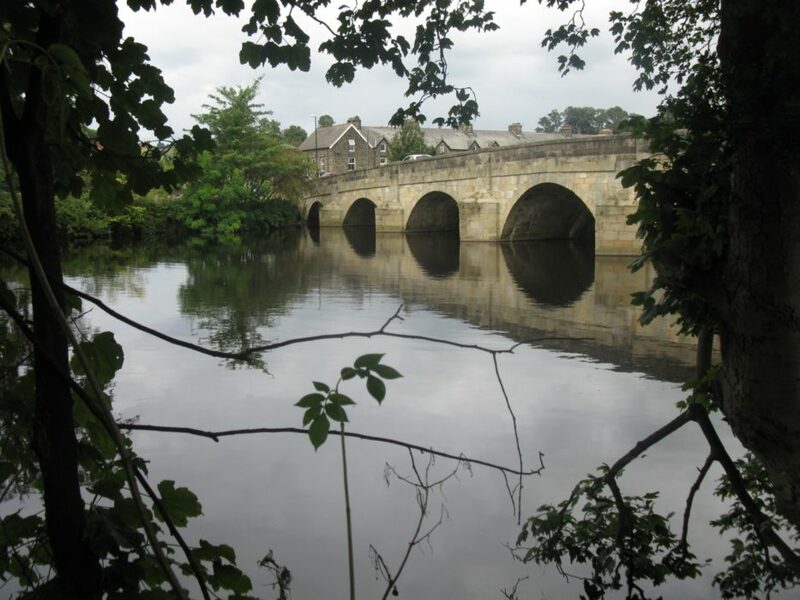 Starting my walk on the elegant, arched Otley Bridge over the River Wharfe, I tried to adopt the mindset of a 17th century general. In 1648, in the age before turnpikes and the Ordnance Survey, there were no proper roads and no proper maps. The rivers and hills were the key navigating tools and there were also fewer enclosed fields, more woodland and fewer bridging points over the rivers. Crossing points of rivers were to prove the vital key in the speedy movement of a 17th century army. I walked from Otley Bridge through the town’s medieval market square past the Black Bull Inn, a hostelry drunk dry once before by Cromwell’s troops after the Battle of Marston Moor in 1644. Four years later Cromwell may have stuck close to the banks of the River Wharfe heading west to Ilkley, but the busy A65 road now makes this an uninviting route for walkers. 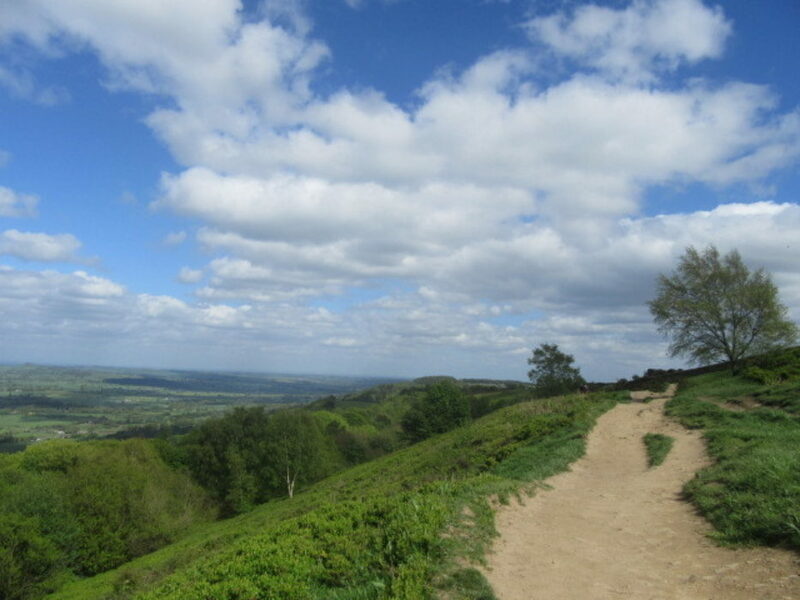 Instead, I followed the wooded moorland ridge known as the Chevin, on the south side of the river. 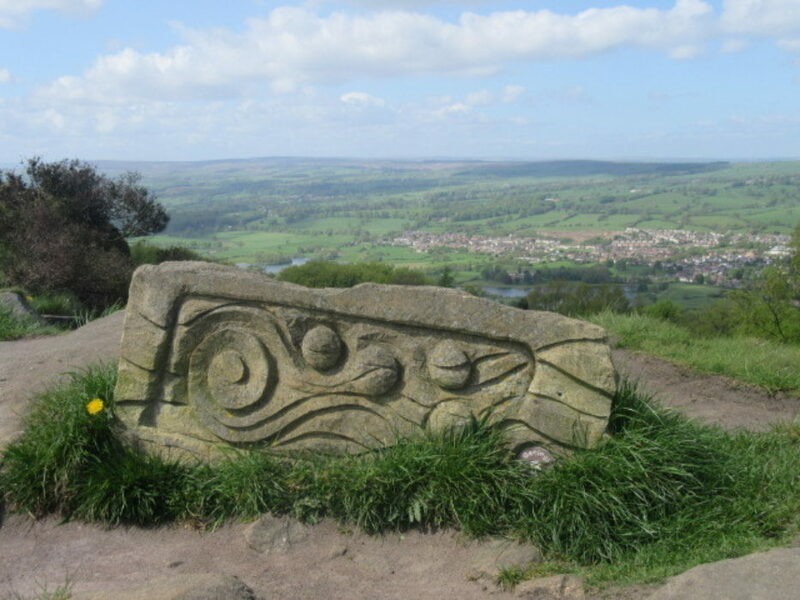 This rises steeply from Otley to provide a commanding view of half of Yorkshire. The ridge would have been followed on horseback by Cromwell’s advancing scouts looking for signs of a Royalist army coming down from Scotland. 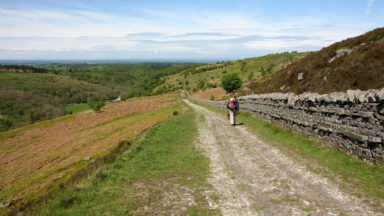 The waymarked walking trails of the Dales Way Link from Leeds and the Ebor Way from York make use of the ancient tracks traversing the Chevin and eventually lead to the rocky outcrops of Ilkley Moor, another good vantage point for an advancing army. I dropped down to the elegant spa town of Ilkley, past the walled remains of the Roman fort of Olicana. Here I joined the start of the Dales Way at the Old Bridge and followed the River Wharfe to Addingham. 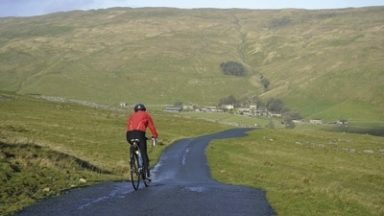 An ancient green road over the moors then leads to a spectacular view over Skipton, where Cromwell’s route westward towards Pendle Hill and Lancashire would have been laid out before him. In 1648 Skipton was a cluster of cottages huddled around a corn mill, church and castle keep. The town’s medieval stronghold, rising in a sheer cliff above wooded Eller Brook, was the Royalist stronghold of Lady Anne Clifford and had already spent years under siege, being battered by the heavy artillery of the Roundheads. 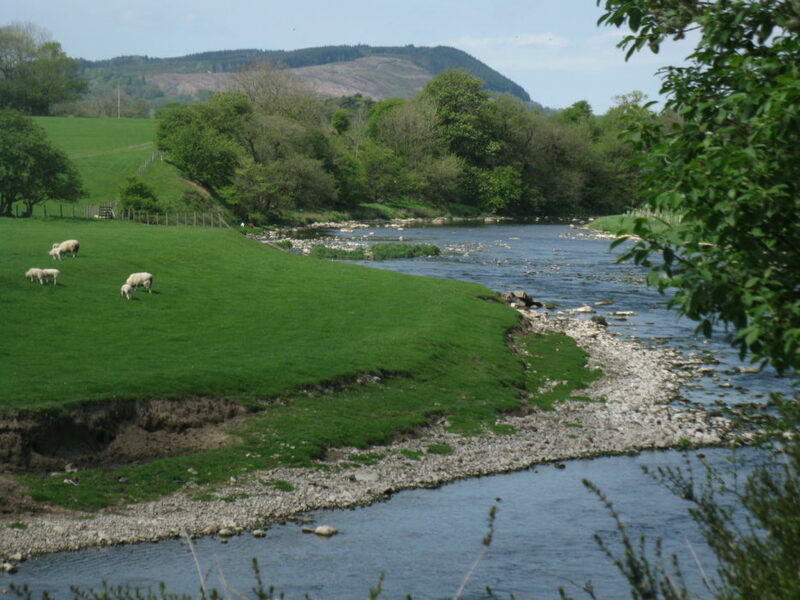 Cromwell’s forces moved swiftly on from Skipton on 15 August and followed the River Aire, which carved a natural gap in the Pennines, towards Gargrave. The main A65 road from Skipton heading north-west to Hellifield was just a rough track in Cromwell’s day even though it was the best road in the district, part of the King’s Highway from York to Lancaster. In Gargrave, I crossed a bridge over the River Aire via the Pennine Way, next to a Roman paved causeway built across the river bed. This can still be seen when the water level is low. 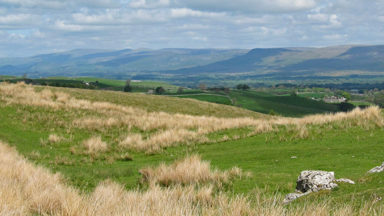 The rolling sheep hills of West Craven form a pleasant ramble towards the River Ribble through countryside little altered since the 17th century. 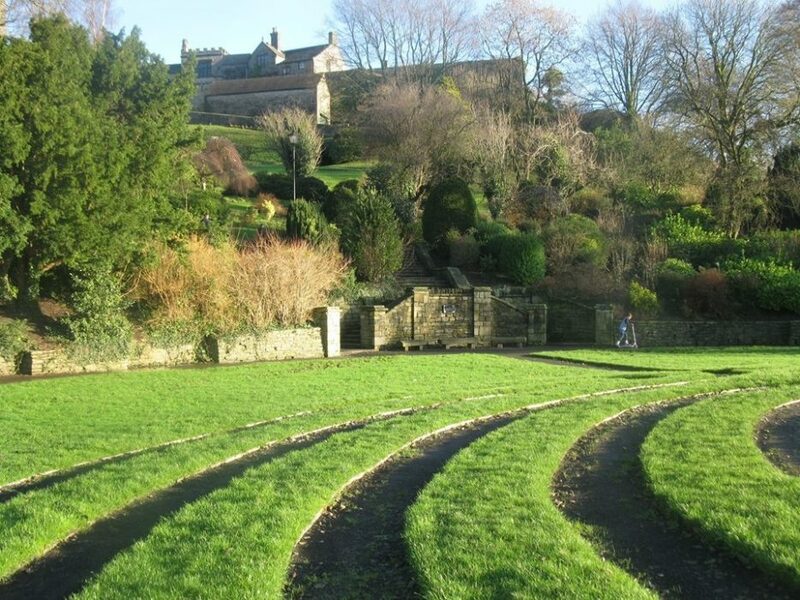 It is a charming landscape of hedged tracks winding between peel towers, ancient halls and Norman hill forts. Beyond the parkland around the restored 15th century Hellifield Peel, I crossed the River Ribble and followed a section of the Ribble Way downstream to reach a steep-sided wooded bluff on the east bank of the river, locally known as Cromwell’s Basin. On top of this hill are the circular moated remains of Castle Haulgh, a Norman fortification, alongside which the Pennine Bridleway now runs. The New Model Army passed this way and it is only a mile from where they camped at the end of their day’s journey in the cattle-grazing parkland of Gisburn Hall. On 16 August 1648 Cromwell’s men marched south-west, downstream, through the boggy valley of the River Ribble. The river here formed the boundary between the West Riding of Yorkshire and Lancashire. 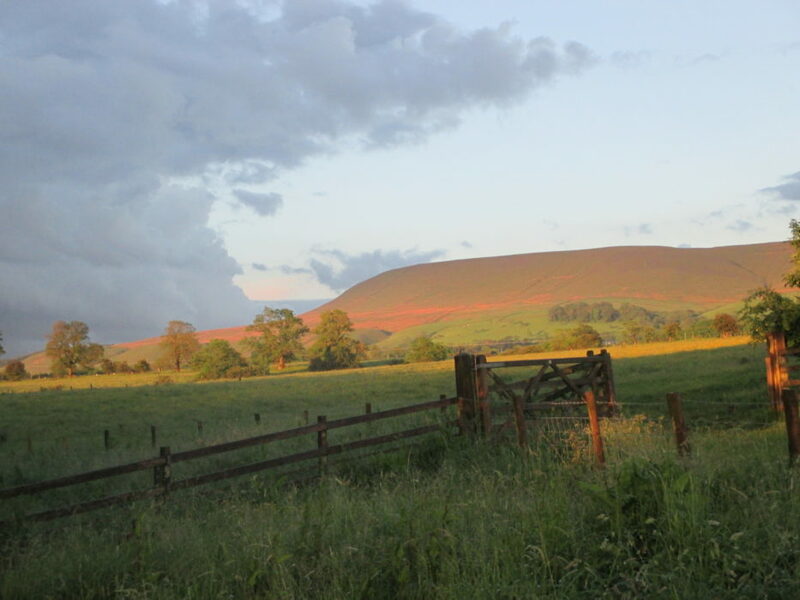 Navigation would have been relatively easy – follow the river and keep the brooding hump of Pendle Hill on the left. 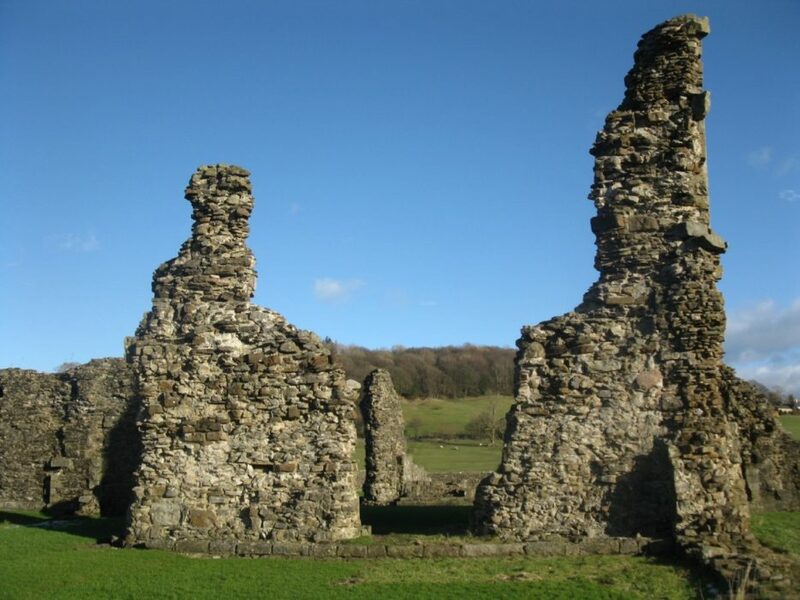 The army passed the Cistercian ruins of Sawley Abbey to arrive at Clitheroe, where a tiny Norman keep overlooked the medieval town. 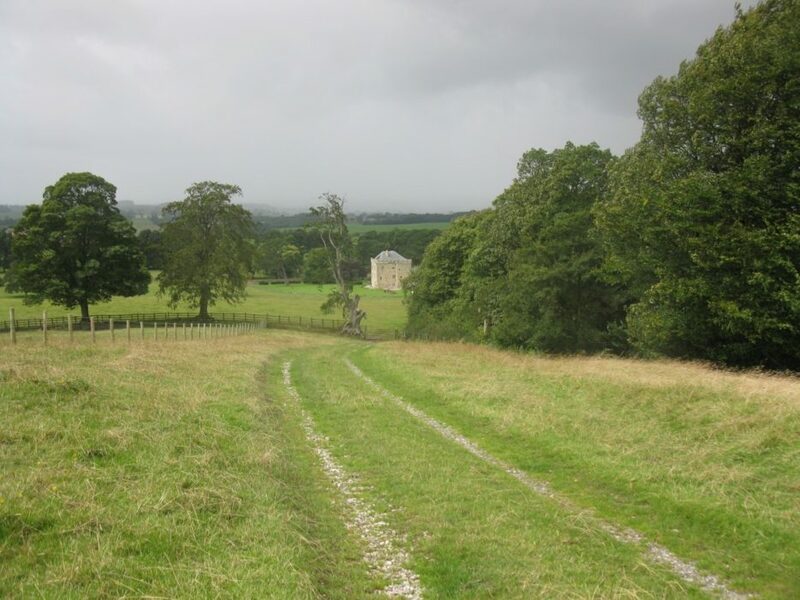 I retraced Cromwell’s route through the Lancashire borders simply by following a section of the Ribble Way footpath. 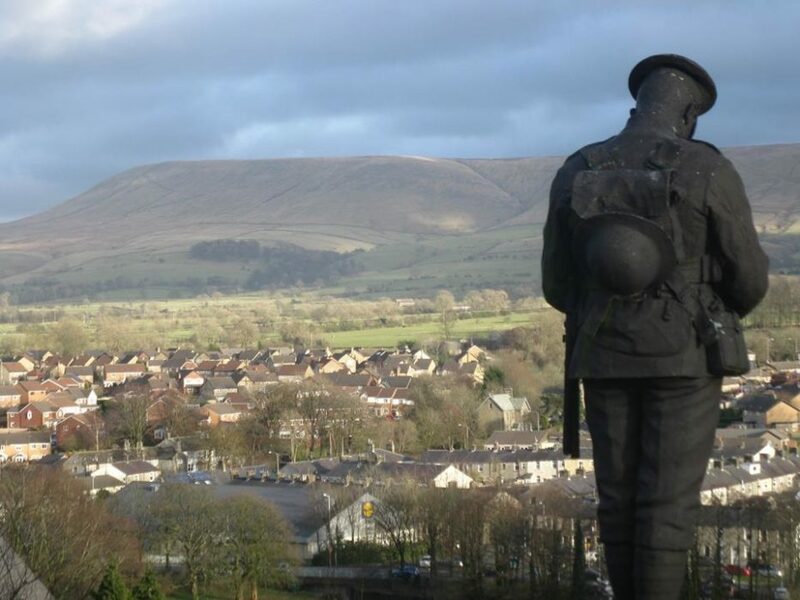 Surrounding Clitheroe are unspoilt riverside villages nestling below the stark fells of Pendle and Bowland. 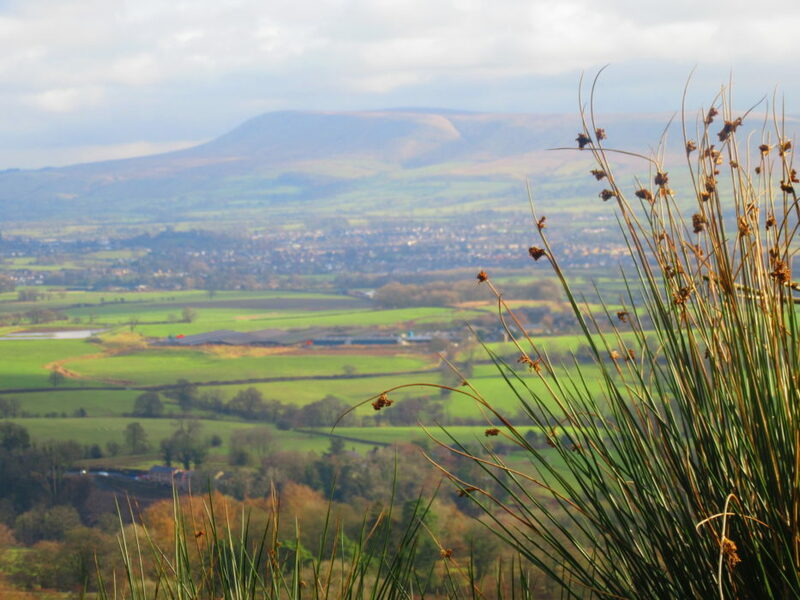 This is a countryside with a timeless, ancient feel, dominated by the brooding outline of Pendle Hill and its early 17th century associations with witchcraft and superstition. Like Cromwell, I followed the north bank of the River Ribble after crossing Edisford Bridge. Rolling pastures then lead to the medieval church at Great Mitton and one of the highlights of the walk – the graceful bridge over the River Hodder known as Cromwell’s Bridge. 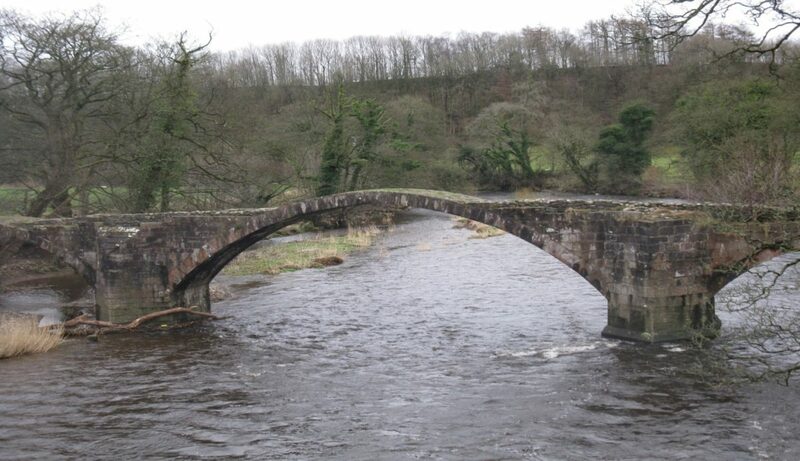 With its three slender arches over the wide pebbly Hodder this provided the lowest crossing point of the river for pack horses. It is hard to imagine Cromwell and his 9000 men – plus heavy artillery – crossing over this now fragile-looking structure. A mile from here I ended my day’s walk at one of Lancashire’s other architectural gems. 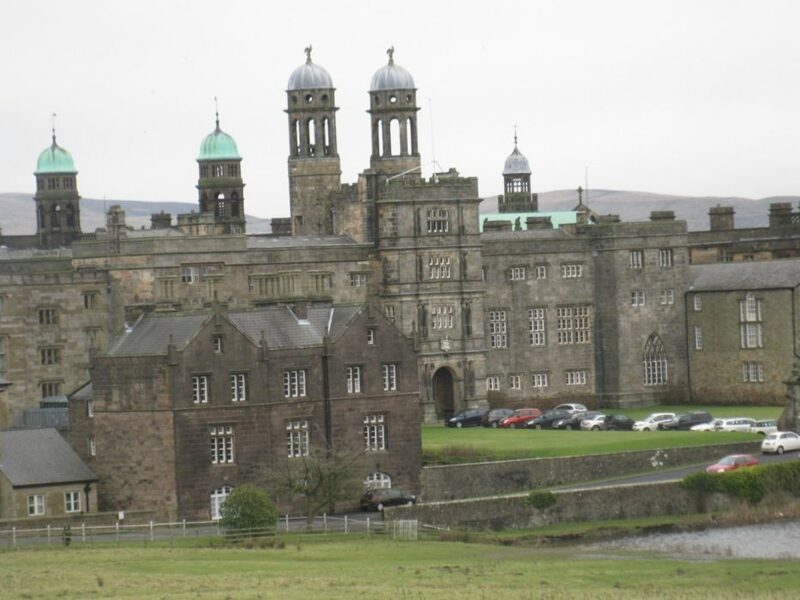 The castellated Jesuit school of Stonyhurst College was the half-built home of the Catholic Shireburn family when Cromwell spent the night here. His troops encamped in the parkland nearby but Cromwell invited himself into Shireburn Hall and reputedly slept on an oak table (still there today) in a full suit of armour for fear of being assassinated by his papist hosts. 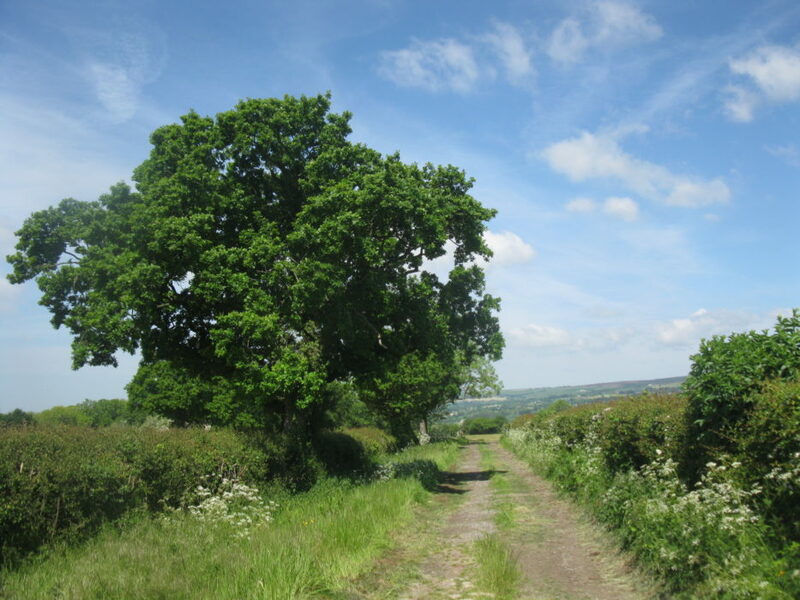 The last day of my walk corresponded to the final fateful day of Cromwell’s march. 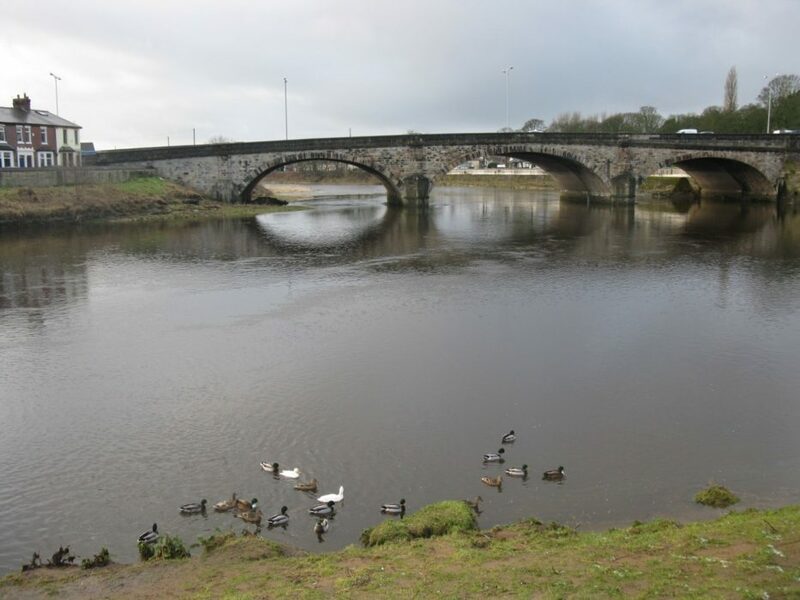 On 17 August 1648 his troops covered a distance of over 13 miles, then surprised the straggling flanks of the ‘Engager’ Royalist army, fighting a bloody battle on a bridge over the Ribble below the town of Preston. 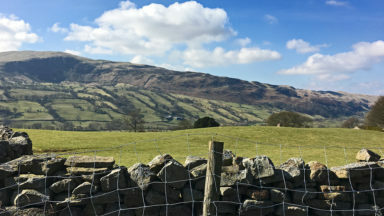 I walked along the lower slopes of Longridge Fell, the most southerly named ‘fell’ in Britain, and legend has it that Cromwell himself gave the name to this ‘long ridge’. 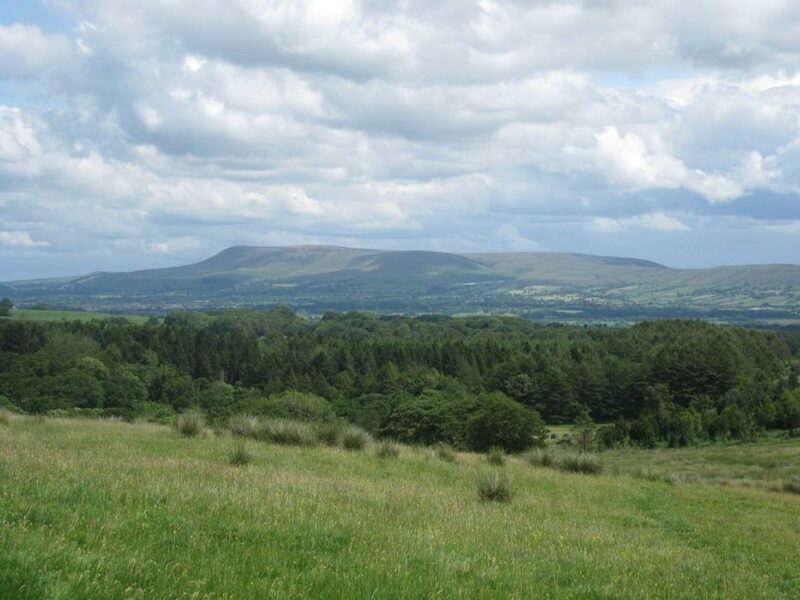 From here there are commanding views west to the tightly hedged paddocks and wooded copses rolling down to the River Ribble. 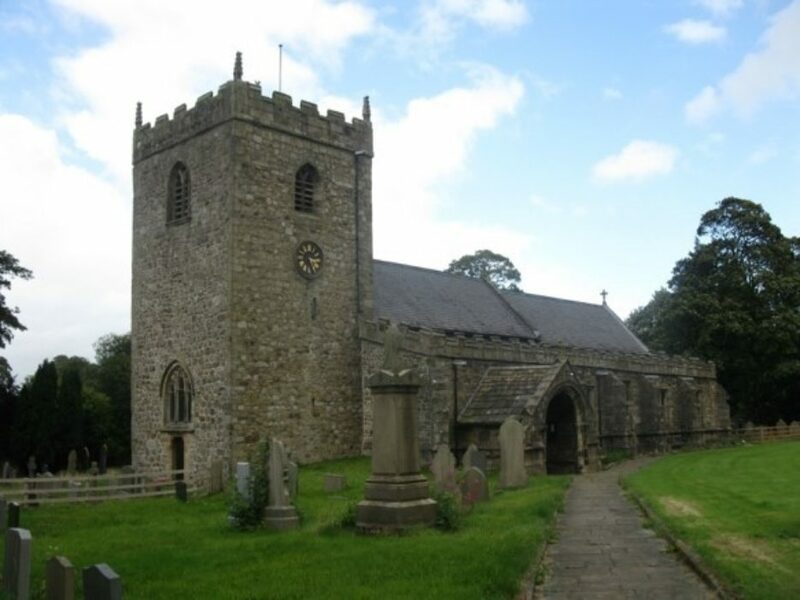 I passed through the town of Longridge, the present parish church standing on the site of the chapel where the first skirmishes between Roundheads and the Royalists took place. It was a foretaste of the major battle to come later in the day. 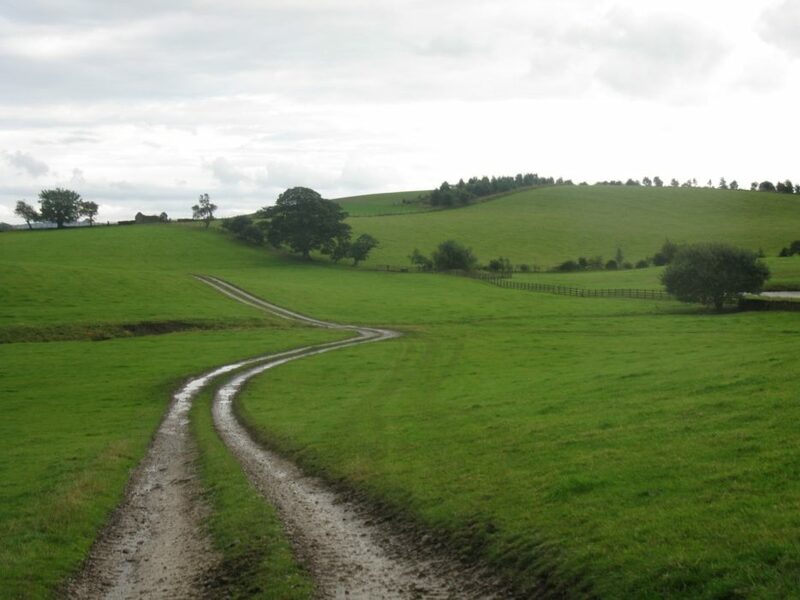 Field paths, partly along the disused Preston–Longridge railway line, then led through the village of Grimsargh. 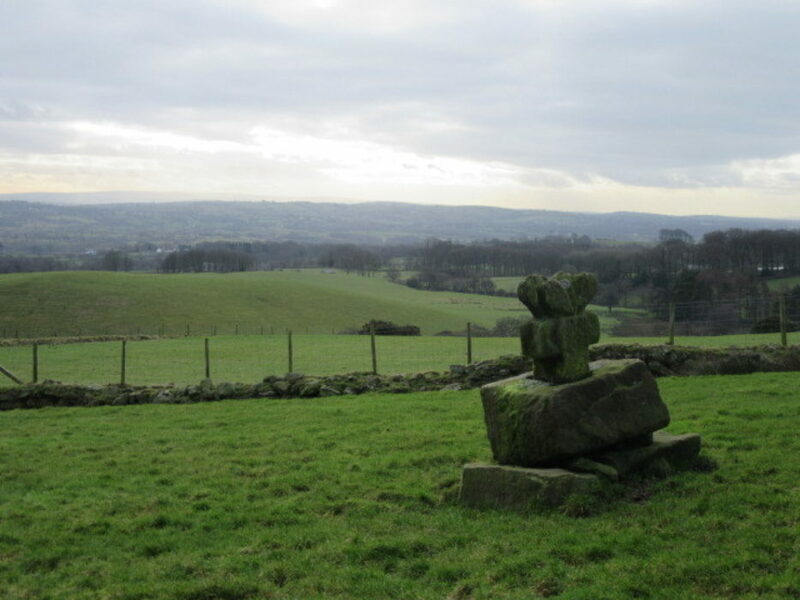 From here Cromwell’s men descended to the Ribble via Ribbleton Moor, an area now covered by a Preston housing estate. I skirted around this and discovered that behind the red-brick semis you can still follow some of the ancient sunken lanes from Cromwell’s day, like Watery Lane, which winds down to the river. Beyond a copse of trees, now named Cromwell’s Wood, I emerged on the Ribble floodplain, where flocks of geese waded below the arched bridge carrying London Road, the A6, over the river. I ended my four-day walk walking over the bridge, a replacement for the medieval structure upon which Cromwell’s troops had forced the Royalists south of the river in the August battle. There was an anti-climax on the floodbank south of the river. The site of the Battle of Preston 1648 is now the dreary car park of a retail park, with no indication that the decisive final military action of the English Civil War took place here. 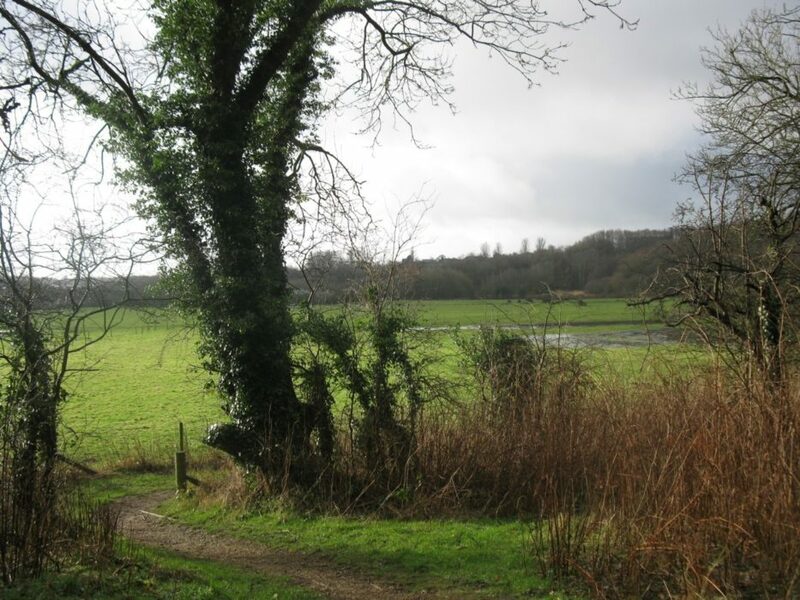 Putting a Civil War themed long-distance walk on the map would, perhaps, help revive this forgotten battle site as a fitting end to a walk through ‘1648 country’.